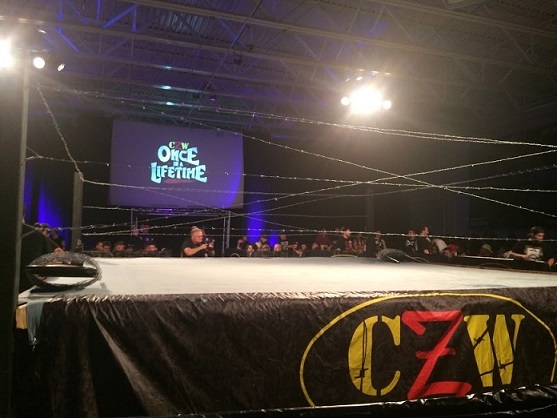 I flew into Philadelphia in the early morning on August 5th to get the chance to watch Atsushi Onita wrestle live for the last time for the CZW promotion in Vorhees, New Jersey at the Skate Zone. My fiancée and I arrived at the show several hours early after getting messaged by Mike Johnson from PW Insider about doing a documentary interview on Atsushi Onita wrestling in America for the first time in 25 years. The camera crew had been following Onita since he and his crew of Raijin Yaguchi, Hideki Hosaka, and Pandita flew in. 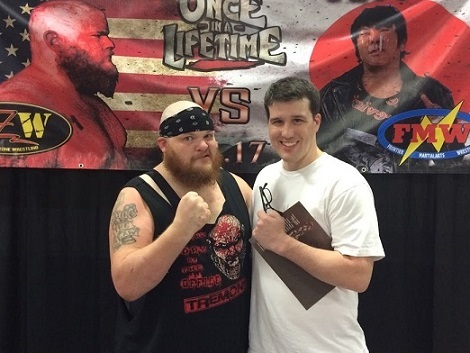 I met up with outside and went on in where they sat me down to talk about Onita. I have done a couple of Podcasts but these things are always kind of tricky for me because I have all this knowledge about the topic of Onita but I have to kind of dumb it down or else I will go over the majority of everyone's head that would be watching it while still being informative. They ended up asking me a lot of random questions that I did not think the interview would go. They asked me if I had heard the main event would turn into a 6 man and how come Onita is no longer in politics which is a tricky thing to answer without just saying he got caught for having orgies as well as if I thought Onita would get back into politics after he retires. 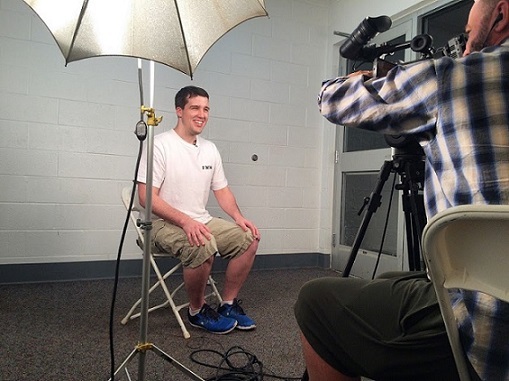 It was a fun experience and I did not know if any of my footage would even make the final release but I have been contacted since the filming of it and apparently it was just me and someone else they sat down to interview for it. I also know they were at Onita's hotel when he arrived to film him. During the interview I saw Onita, Yaguchi, Hosaka, and Pandita walk by me as they had just arrived to the building. I was heading out of the building when CZW owner DJ Hyde stopped me to thank me for doing the interview. We ended up hanging out in the parking lot for the next couple of hours. 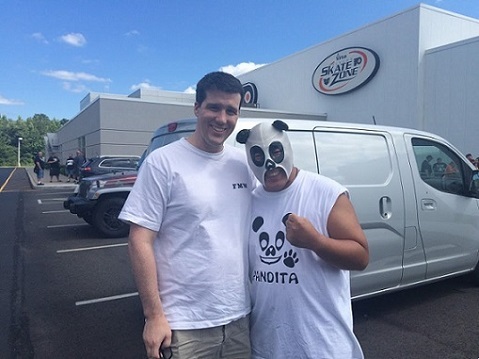 I ended up seeing Pandita come out so I had to get a picture with him. While we were out there I met so many people that told me that they had been fans of my site for the last 15 years or so it was unreal. Just getting to meet so many people made the trip worth it for me alone. 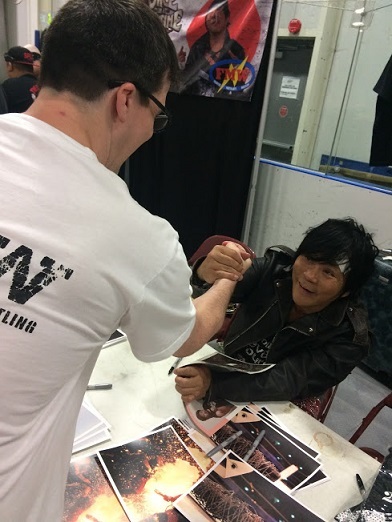 CZW then opened the doors They ended up forming two lines for people to go inside and meet Onita. I thankfully only ended up having to wait 5 minutes or so in line before getting to see Onita. I had him sign an old 1990 FMW program that he had a great reaction to. I also mentioned about him meeting him at the FMW After Party last year after a Korakuen Hall show which he told the woman that was with him selling t-shirts for him. 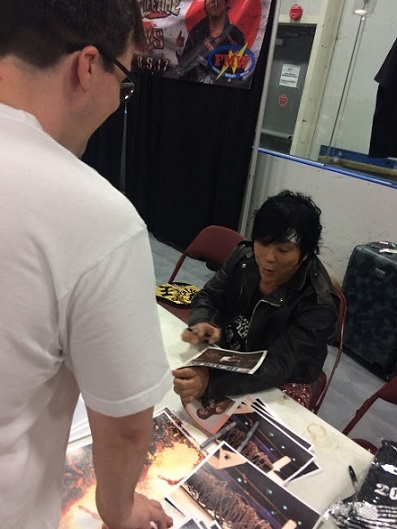 Onita was super nice to everybody in line and it seemed like there was no way that he was going to get to see everyone in just 90 minutes as he was really interacting with each and every fan. He came off really well here to all the fans. While in line I also got to take a picture with Matt Tremont and Raijin Yaguchi who were very nice to everybody and I also gave Hideki Hosaka a Get Well card for his two fractures in his jaw as well a Happy Birthday card. We headed back outside and hung out with some great people that traveled as far and even farther than we did for the show. I got to meet Al and Mike of the Virtual Pros podcast who are always really complimentary of me and the site whenever the FMW is brought up on their show. One of the interesting things about the Skate Zone is that on one side of the building is a skating rink with families taking their kids and the other side of the building you have the CZW fans which many fit the stereotype that comes with being a smart wrestling fan. The line for the show ended up getting huge right as it got closer to bell time. We ended up sitting by a woman and her fiancée who are in the picture above where we are pretty sure she did think wrestling was real and her fiancée took things way too serious as he got so mad after the Lio Rush and Joey Janela match that he started visibly shaking and cursing while everyone else in the crowd was clapping for the performance. Next to them though was a Japanese fan who at least helped make the Onita experience a little more authentic. The opening match was probably my favorite match as Pandita was great and got over with the crowd with his spots as many fans were chanting for "Panda". Raijin Yaguchi and Hideki Hosaka put on a good performance as Hideki Hosaka looked really good out there for a 46 year old with two jaw fractures. MASADA who before the show I asked if he was ever going back to FREEDOMS and he told me to tell Sasaki to bring him back was in the only match that really that just did not get over with the crowd and made the show drag. Lio Rush vs. Joey Janella was a fun match although it went way too long for my liking especially following that MASADA match. Matt Tremont then came out to the biggest pop of the show and it was not even close. 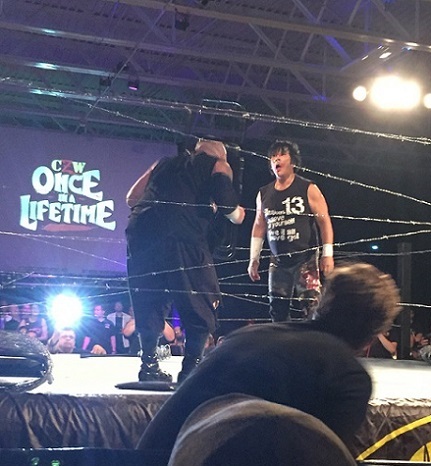 I was expecting Onita's pop to match his but it defiantly did not match him as it was apparent that a big majority of the crowd were CZW fans that really had no knowledge of Onita other than his "I be there" YouTube promo. Onita still got a really good reaction through all the fans that traveled to see him and the match was an Onita match. It was just a No Ropes Barbed wire Exploding Barbed wire Baseball Bat Death Match as the Exploding Barbed wire was just never going to happen with a ring so close to the stands in a building ran by the Philadelphia Flyers. The match was an Onita match and to me that's a very fun match live. He brings energy and a lot of the match is smoke and mirrors but you can not complain about that from a 59 year old man who has destroyed his body for wrestling like Onita has. Onita went into the barbed wire and took a exploding barbed wire bat shot and both he and Tremont spit mist into each others faces. The exploding barbed wire bats were different as in Japan they explode after hitting the person but here they exploded at just swinging them which Onita did not like. Hosaka and Yaguchi ended up interfering to set up the 6 man but what looked bad was they had barely done anything to Tremont and were not even doing anything when the CZW guys came out to make the save. The crowd did groan at this but when the match started back up the energy was able to pick up somewhat back unlike what other people have said. Yaguchi ended up picking up the win which upset some people that Onita did not get the pin himself. 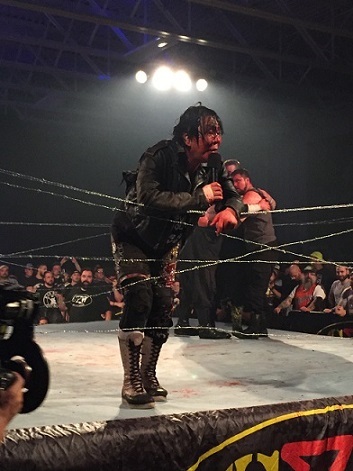 Onita then got on the mic and stated that CZW was cheap several times because of the lack of explosions in the bats that they used. Onita then cut an English promo which was difficult to understand for the most part but he asked for Tremont to come to Japan in October and Onita will show him a real explosion with Tremont accepting. Onita then did his Onita Theater and poured water into the crowd which last year was one of the most amazing experiences for me seeing live at Korakuen Hall where he had hundreds of people screaming for him and just how he was able to have control of the audience for almost 30 minutes. Fans being able to pat the mat, not being to understand him completely, and a lot of fans not really knowing him or liking Tremont more all together resulted in just the magic not being completely there although no matter it is always a cool scene live to watch. 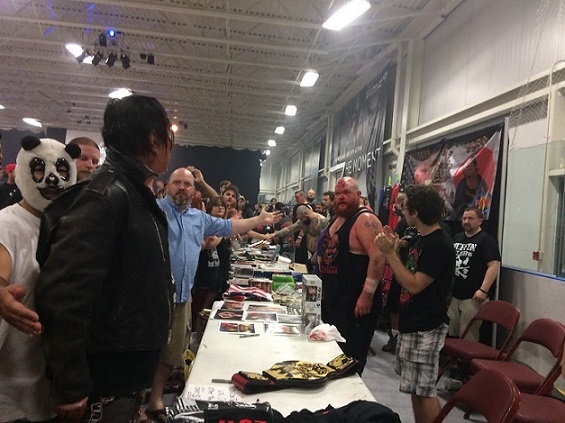 Onita ended up going back to the gimmick table where he spoke to Tremont before sitting down. He would take pictures if you had bought a t-shirt for 40 dollars which is not anywhere close to the lies that some people were making up stuff about him charging $70 but I still was not a fan of that as the people that bought a shirt earlier were not able to be a part of that deal. The show overall was a really fun experience. There were flaws but that is just going to come with the territory with any smaller promotion these days. It was a great experience live and I had great overall time through out the whole day. We headed out to Philadelphia the next day where the weather was beautiful. Although there is not much tourism activists compared to other major cities we still took a picture with the Rocky statue, went up the stairs of the museum, and saw the Liberty Bell. 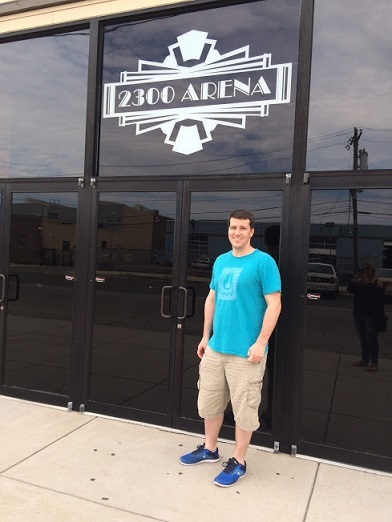 We also stopped by the former ECW Arena now the 2300 Arena as growing up in Louisiana and only being a teenager in the 90's there was never a chance to actually go to an ECW Arena show but it was interesting to see the area and we went to Tony Luke's Philly Cheesesteaks which is very close to the Arena. We headed out the next day but not before going to a retro video game store in Glenside, Pennsylvania called Classic Game Junkie which I loved out. Overall this was a great trip. The weather was great, the show was a lot of fun, I got to meet some really cool people, I got to see Onita live once again probably for the last time, and I got to see a really interesting area of the country I probably would have never thought to go to in 2017 if it wasn't for one man participating in a wrestling show.